I am glad I tested the Invisible Shoes because they got me to try several things, including going barefoot which has been fun and a great learning experience for me. I made a video of myself trying several different shoes to see how it would affect my running form. The video showed that my running form is just not all that good in any running shoe, including barefoot. It’s not bad for a beginner, but it’s certainly open to improvement and I feel the best way to work on my form is to do it in the Neos. I have currently run approximately 60 miles on these shoes, including a few long runs on the weekends. I am at the point where running in these shoes is getting comfortable, and frankly they are now my preferred choice of footwear. I have started to neglect the Mizuno Wave Universe 4 in lieu of running more in the VIVOBAREFOOT Neo mainly because the ground feel is so much better and direct. It is incredibly close to barefoot running, but obviously not the same as barefoot running. Barefoot running provides more feedback, and I encourage everyone to try it at least once even if only on a treadmill. It gives much better feedback on your running form then any shoe (or huaraches/VFF) will. Overall, the runs feel satisfying and good. I am not at the point where I can run forever in the Neo like I felt I could in my older more cushioned shoes. Don’t get me wrong though, it's not because the old shoes were better for me. I get severe issues with my right hip while running longer distances in my Adidas Adizero Rocket but I have no issues with the Neos so far. I just get tired faster because new muscles are being used and I feel that not all my tendons have gotten used to this kind of running yet. With all the horror stories I have read and my own blisters from just a few hundred feet of barefoot running in mind, I have been careful (perhaps too careful) not to push myself too far too fast. Now that I have scared everyone away from barefoot/minimal running, let’s talk about the shoes. This is supposed to be a review after all. To me they simply look amazing. I have wanted these shoes for a while and the retro stylish look is rather appealing to me. In fact, I have worn these to casual gatherings and even a festival in my town and I haven’t heard anything negative about them at all. Explaining to people that they are actual running shoes, or rather, that I use them for running is a whole different matter. Some people still think I’m a bit weird, but I can live with that. They are very comfortable and form to your feet when you put them on and lace them. The best part of the shoe (for me at least) is the wide toe box. 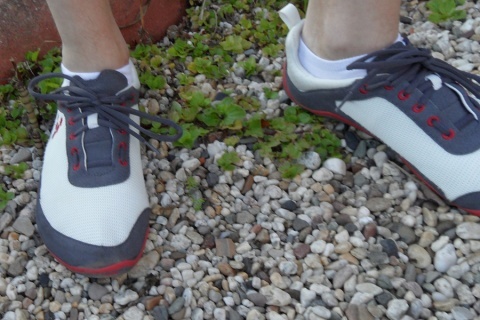 It allows my toes to move freely and comfortably while the shoe remains more snug in the heel preventing your feet from moving inside the shoe. The laces allow you to really tie it in any way you wish. 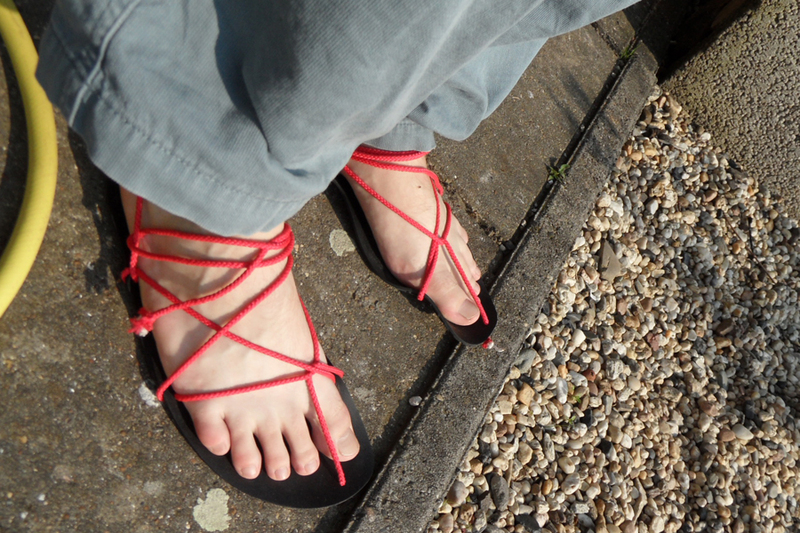 I used the Altra method of tying, shown here, which allows my arch to feel more free and less constrained. It works very well in this shoes and feels very free. The sole is literally 4mm which is very thin. It feels like you are walking on the ground because the shoe gives enough room for your toes to move freely just like when you are barefoot. It’s rather amazing really, and the quality of the shoe is very high. All the stitches and final touches and attention to detail is better than expected, and I already was expecting a lot for the price they ask. 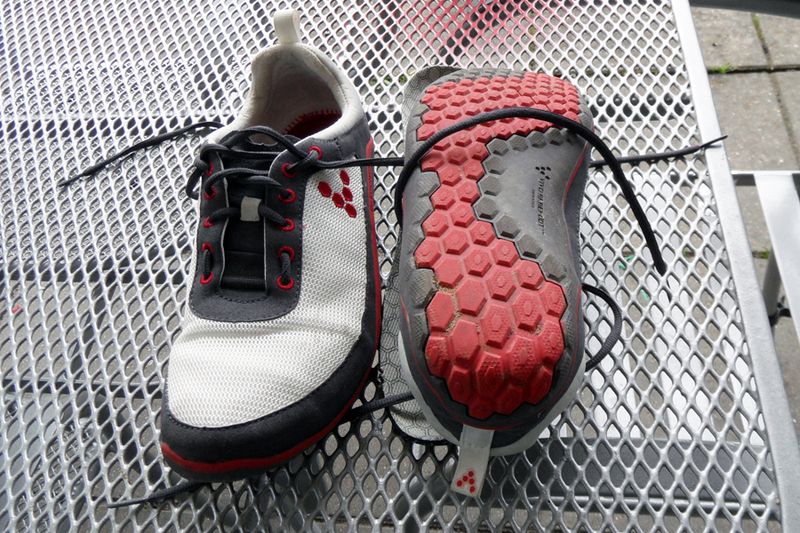 These shoes don’t seem to wear quickly, but there is some already and its fun to see where they have worn off for me. The heel is the worst, but this is most likely because I have been walking around in them a lot. There are more interesting wear spots are near the top, most surprisingly right under my big toe. Overall, the wear has been very minimal compared to some other shoes that I have had and I think they will last for a very long time. With the new Neo Trail coming out (Derek has a pair and will review them), I wanted to clarify what kind of grip you can expect from this shoe. 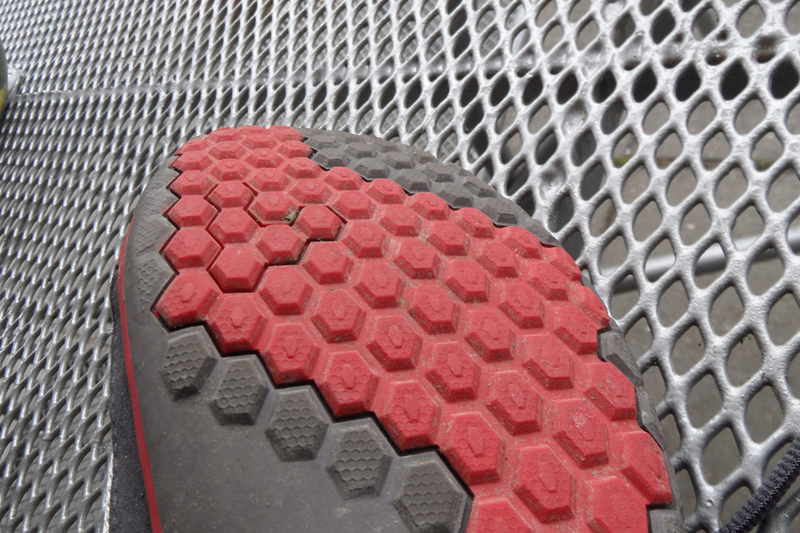 As you might have seen from the pictures, it has a bee hive pattern that looks great and gives plenty of grip on the road. 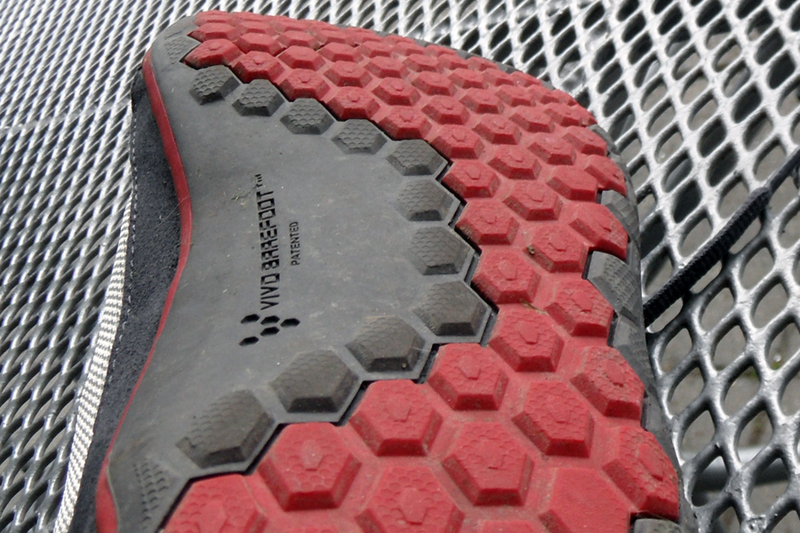 On trails, it gives enough grip as well as long as its dry. When it has just rained, some areas can be quite slippery. 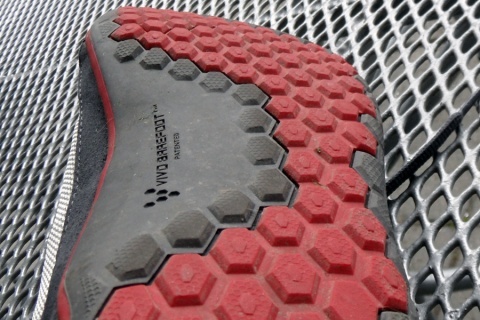 I am mostly a road runner so it doesn’t matter, but for those who love to run trails it might be better to wait for the VIVOBAREFOOT Neo Trail. 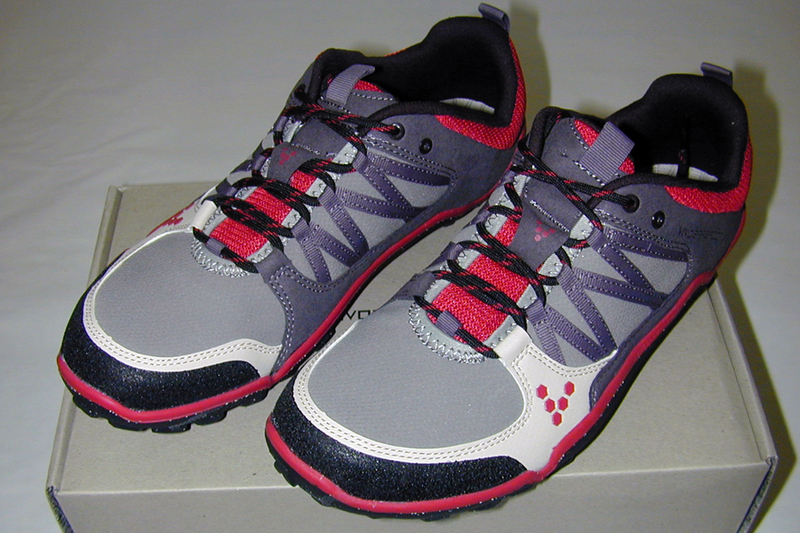 The Neo Trail looks to be an amazing shoe specifically for trails. I am truly happy with and excited about these shoes. 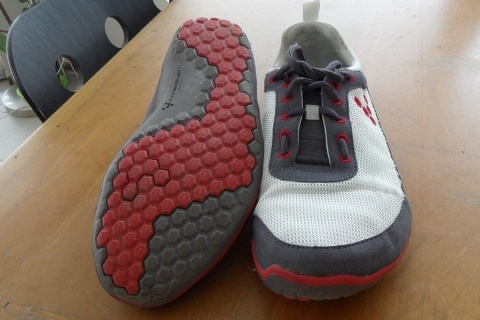 I have already committed myself to doing two races in the VIVOBAREFOOT Neo. The first one is a 10k race on 25 September and then a longer and more popular race in November with about 23 thousand(!) contestants. This will be a new experience for me and hopefully a lot of fun. The only flaw this shoe has is the lack of ventilation and with higher temperatures, my feet did start to sweat quite a bit. This hasn’t been an issue with lower temperatures around 20C (68F) which are more common for me now and it will only get cooler from this point forward. This is really nitpicking though because I see this “flaw” as an advantage since it is getting cold here quite fast, and I don’t mind warm shoes when the weather is cold. All in all, I am very pleased with these shoes because they tick all the right boxes for me. They look like shoes and they provide the barefoot/minimal feel that I want. When people see them they just see nice shoes. I know some people like the attention they get when running in VFF or huaraches, and admittedly so did I when I tested them. I run 4 times a week in a crowded suburban area and I don’t want to grab everyone’s attention every single time.